If you want to make your spring vacation in the Ozarks a memorable one, ride in a kayak and paddle your way to the crystal clear waters of the lake. At the start of the spring season, many of the vacationers in Branson are heading to the lakes to enjoy water sports activities. Floating on the clean winding rivers is one of the favorite outdoor adventures in the Tri-Lakes area. During this season, many people seeking to experience water adventures want to join the fun at the Biggest Flotilla Adventure in Lake Taneycomo near the Shepherd of the Hills Fish Hatchery just downstream from Table Rock Lake and float eight miles to Branson Landing. The flotilla is approximately joined by about 30 kayaks and canoes. Kayak Branson invites local residents and visitors alike to join two flotilla trips on Lake Taneycomo. Flotilla Adventures is a three-hour float along Lake Taneycomo. Kayak Branson offers available kayak rentals that include three dozens single, double and triple kayaks and canoes. Those who have their own boats are also welcome to join the flotilla. As the flotilla is cruising smoothly along the lake, guides will share facts about the history and topography of Lake Taneycomo. Kayaking is a great water sports activity that is growing rapidly today that has evolved into a popular sport across the country. This water adventure can be more fun, even if you have no previous experience, as there are guides to assist first timers. Kayak Branson offers guided trips for fishing, family activities, family reunions, youth groups, or church groups. Kayak Branson also offers sunset and moonlight tours. Some of the guests can ride on the kayak or canoe on their own without a guide, as they will be given instruction by guides before they start to paddle. You can also rent a kayak, canoe, paddleboard or bike at the White River Kayaking and Outdoors located in historic downtown Branson. This place also provides easy accessibility to Table Rock Lake and Lake Taneycomo. Whether it’s your first time to paddle or have tried to paddle many times, White River lakes can be a perfect setting for canoeing and kayaking. As the spring season offers a smooth flow of the waters on the river, there is no better way to enjoy in the lake than kayaking or canoeing. The White River Kayaking and Outdoors also offer rentals on single and tandem kayaks, as well as canoe rentals for two or three people. It also offers rentals for stand up paddle boards (SUPs), which is great for paddling around Moonshine Beach at Table Rock Lake and Branson Landing area in Lake Taneycomo. Bike rentals are also available if you want to enjoy sightseeing in the parks and at some trails in Branson. 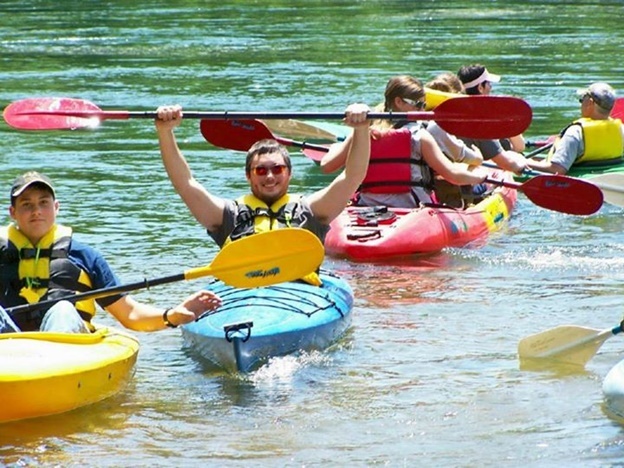 Kayaking is an exciting lake fun activity, and if you want to join the fun, be a part of the celebration of Kayak Flotilla Adventures in Branson that will be launched in Lake Taneycomo.